Are you looking for a way to increase individual contributions? Would you like to be able to , very subtly, encourage your patrons to donate “just a little more”? Perhaps Challenge Coins are the answer. Challenge coins have very high “perceived value”. Unlike coffee cups, pens, t-shirts and such they will be highly prized by your donors. For about the same price as a t-shirt or coffee cup you can encourage your donors to do a much more. 1. The Medallion or Challenge Coin is relatively inexpensive to produce but beautiful and of a very high “perceived value”. The initial set-up charge or “die charge” can be used for each level of award. Same die, just a different color metal. This offers a considerable savings over other presentation items that require separate setups for each level of award. 2. 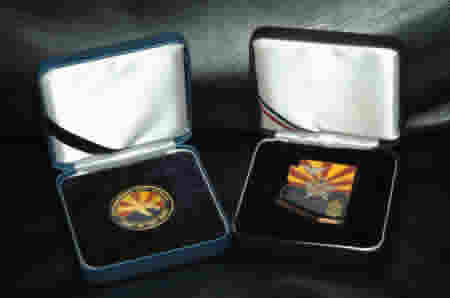 The Challenge Coins can be easily and conspicuously presented. Imaging being able to recognize your donors with a tangible token (no pun intended) of your gratitude. Used as a table gift, donor medallions can make a beautiful, convenient and affordable addition to your fund raising event. 3. What donor wouldn’t want to go from Bronze to Silver when they receive such a beautiful symbol of your gratitude they can easily display. While we are on this subject, one of the most important benefits of Challenge Coins or Donor Medallions is that they ARE EASILY DISPLAYED. Ask yourself how many plaques, coffee cups or other awards you have that are collecting dust because you have no place to display them. Donor Coins or Challenge Coins can be easily displayed on a desk or end table. They can be displayed in small presentation boxes or on easel stands. In short, they will remain on display in the donor’s home or office long after “yet another coffee cup or plaque” is put away. This gives your Donor the opportunity to discuss giving opportunities with visitors and friends who notice the coin. 4. Our Challenge Coins are very professionally crafted. Unlike cheap “pot-metal” coins these are struck from brass and carefully clad in various metals. They have the weight and feel you want. They can be designed in exquisite detail with or without color fill. We will help with the design work free of charge when you order from us. We can even complete your order in as little as two weeks if necessary. We will be happy to discuss your program with you. Our “resident expert” Rick McCallum will help you through every step of the project. A board member of a prestigious arts organization he understands your needs and is ready to help.